I have a confession. I’ve had iPods for years and own more music than I care to admit. While I did get it all ripped into iTunes a long time ago, I’ve never really been an iTunes power user. That has been changing the last few months though. Recently I’ve started making smart playlists and autosyncing lists to get more out of my music library. This is great but it has also exposed a problem. Fancy playlists depend on good metadata like how you’ve rated a song or when the was the last time you played it. Since I have portions of my library on my laptop and a big library on the family desktop (not to mention an iPod and iPhone), keeping all of this data in sync could be a real chore. This problem gets magnified when my wife and kids get involved. I like Hannah Montana as much as the next dad, but that doesn’t mean she gets to share space with Thelonius Monk and Debussy on my iPod. While at Macworld this year I found a small company named Acertant Technologies that had a booth right behind the Apple area, that section where all of the best little developers seem to land. Anyway, I met Manny Menendez who showed me an application he developed for precisely my iTunes problems called TuneRanger. 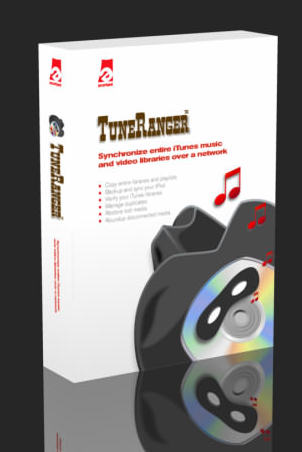 TuneRanger connects all of your iTunes libraries. It then compares the libraries and allows you to share data between them. This doesn’t just include the music files but also all of the metadata. When you first open TuneRanger it gives you a window that shows your local iTunes library and any other libraries on your network. It then gives you drop down lists of playlists on both libraries and gives you several options. 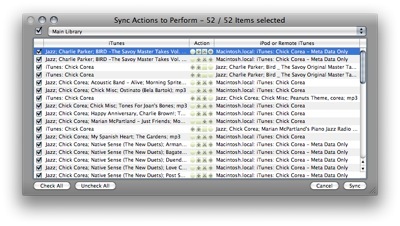 When choosing what to sync you have a variety of filters available including duplicate files, license IDs, file types, genre, artists, album names, and song titles. You can also instruct TuneRanger to trash files marked for deletion or move them to a different folder for later review and deletion. You can force one library upon another or synchronize them. Once you give TuneRanger its instructions it does a preliminary analysis and gives you a dialog telling you what it is going to do and offering you a chance uncheck any specific action. Once you tell it to go, TuneRanger then does the syncrhonization. This doesn’t just work with other computers in your network. It also works with your iPod. You can actually pull music off your iPod and place it in your iTunes library with TuneRanger. TuneRanger is also multiplatform so if part of your library is on a Vista or XP box, you still can synchronize. Since I’ve purged all PC’s from my home, I was unable to test this feature. 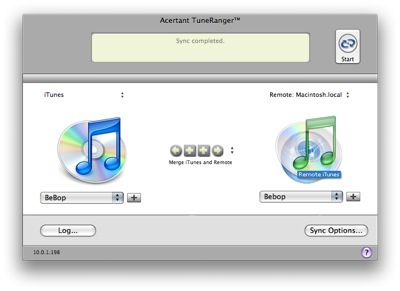 Before using TuneRanger, I treated our desktop computer as the source for all iTunes music. All music had to be ripped on that machine and all iTunes purchases had to be made on that machine. I then had to manually copy the stuff I wanted over to my laptop usually losing all metadata. TuneRanger has really liberated me of this whole process. I can now finally use the iTunes button on my iPhone or buy music on my laptop. It is no trouble to then later upload it to the desktop computer with TuneRanger. It really is that easy. The application costs $29.99 and includes 5 single platform licenses so you will have no trouble getting it on all of the Macs in your household. There is also a free trial available at www.acertant.com. You should be warned though, since getting TuneRanger on my Mac, I’ve spent a lot more money downloading music.